As a community group, pleasure in the playing and performing of Balinese music is the cohering factor of our existence. We also have a high regard for the music and the skills required, and we see our performances as opportunities to raise the awareness of gamelan music in the Australian community. Over the years we have found that we have needed to adapt our presentations to cater for our mainly western audiences, whose listening practices and expectations of music don't always correspond with the structures of gamelan music. This means sometimes running tunes together into medlies, sometimes shortening existing compositions, and at other times collaborating with dancers like Karensa Johnson, musicians like Francis Gilfedder, to produce narrative dance dramas in 1996, 1997, 2001 and 2003. Despite these adaptions for particular audiences, we strongly feel the need to re-identify and strengthen the traditional sources of the music by cultural exchanges with Balinese musicians. 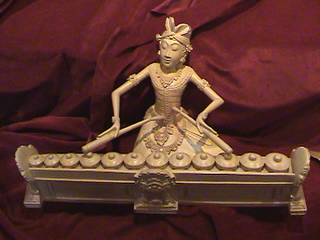 This is not an aim for 'authenticity', which is a problematic concept when we consider that the particular genre of gamelan we play evolved in Bali in the 1930s in response to Western visitors; rather, it is an acknowledgment of the Balinese musical culture that we have transported to play in regional Australia. It is also in recognition of our need for the continued development of our skills, knowledge and repertoire in order to sustain the group.